Before growing vegetables exclusively, I was also into ornamentals. When it comes to container gardening, ornamentals are at the top. 99% of people who own a garden have only ornamentals and there is a reason for it. Who wouldn’t love colors in their garden. Flowers, foliage you name it. There are colors everywhere. Of all the flowering plants I grew, one of my favorites is Petunia. The reasons are very simple. 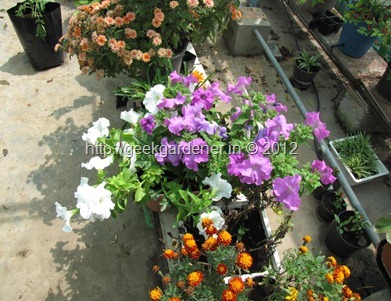 It is easy to grow, flowers throughout the season and big attractive flowers with variety of colors. Of course all these beautiful flowers come after some hard work. That’s what gardening is all about. Grandiflora – The type that produces large flowers and most popular type. Multiflora – Smaller than grandiflora but has lots of blossoms. Milliflora – Small, compact flowers. Groundcover- This variety spreads fast and used as a ground cover. Flower beds can be created with this variety. 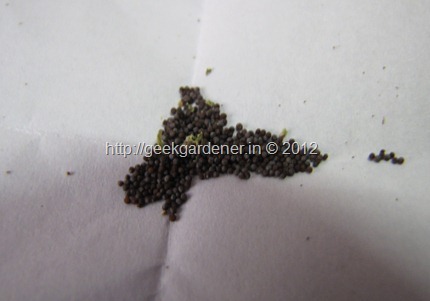 Petunia seeds are very tiny. I mean very very tiny and also expensive. So don’t expect gajillion seeds in the seed packet. Based on the variety, you may get somewhere from few 10s to a 100s. The seeds look like the picture below. Sorry I didn’t place a known object in the pic to relate the size to. 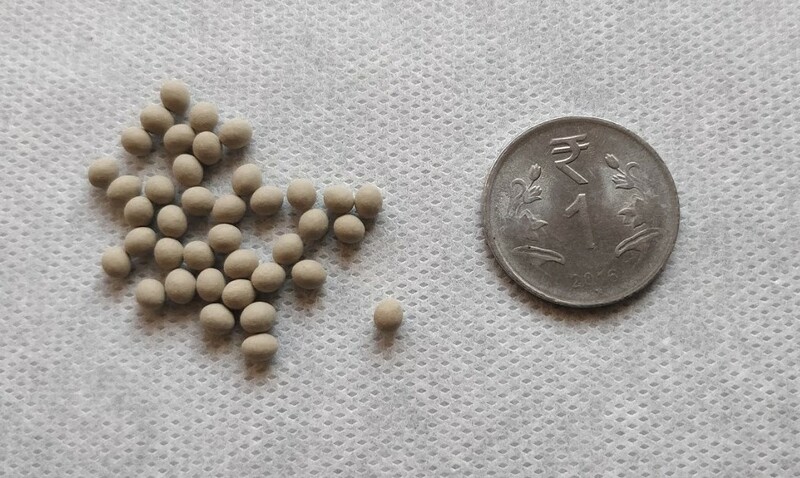 They are smaller than a small mustard seed. Petunia seeds are surface sown. What it means in English is, you sprinkle the seeds on the top of the soil and don’t cover them/bury them with soil. The seed is so tiny and hence the food stored for the germination is less too. So don’t expect it to push whole lot of mud above it. Sow the seeds on the surface of the potting mix. Potting mix can be only coco peat or a combination of coco peat and compost. Since the seedlings are very sensitive, you can use 80:20 mix of coco peat and compost. Sow the seeds and then water them gently. Seeds are so tiny that they can get dislodged if water is poured over them. Cover the seeds with clear polythene sheet. Petunia needs light to germinate. Covering the seeds with polythene sheet keeps the humidity high. Germination happens in 5-7 days. Sometimes more. Don’t get impatient. Seeds don’t know that you are a first timer, they will take their own time :D. Seed starting petunias can be challenging but not impossible. Use the fresh seeds, don’t try expired seeds, they wont germinate. Watch out for signs of growth. The moment you see a seed sprouting, immediately remove the polythene. Don’t let the media dry out. Transplanting is a process moving a plant to its permanent place. 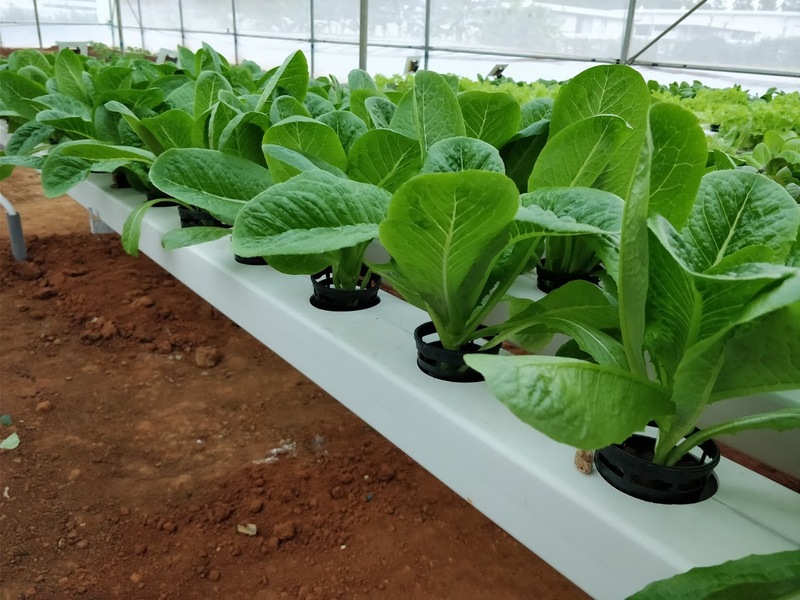 Usually seedlings are raised in one place and they are transplanted to a different place. 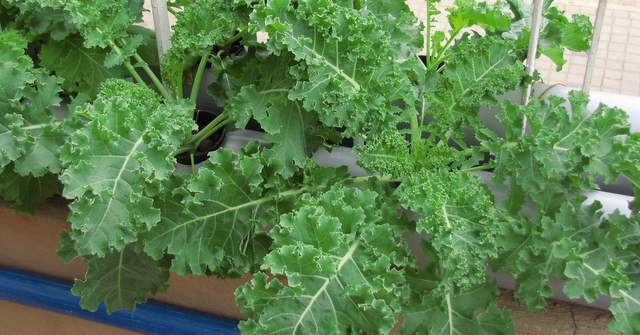 If you are raising the seedlings yourself from seeds, then transplanting is done after seedlings are about a month old. If you are buying small seedlings of petunia, from the nursery , then you need to move it to a bigger pot or something like that. A good potting mix is required for growing flowers. To make a soil based mix, mix equal parts of red soil, compost and sand. The red soil should be the one that is used for garden purposes not the ones that are used in road construction. People sometimes get cheated. Get it from a good place. Lalbagh is ok. I will be soon making my own mixes available, if you are interested please get in touch. Last but not the least. Location! Petunia needs good amount sunlight. At least 4 hours of sunlight. They do better when kept in full sun as well. So pick the sunny spot. Lesser the light, fewer the flowers. 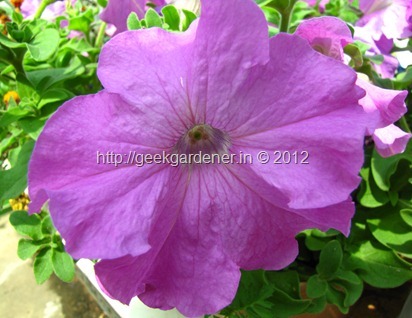 Petunia needs good sunlight, well drained soil. Add a handful of compost to the pot when the plant starts flowering. Periodically remove the flowers that start fading. Removing spent/faded flowers is called as Deadheading. This promotes more flowering. You can continue to deadhead through out the season. If you want to save seeds, then you should NOT deadhead. 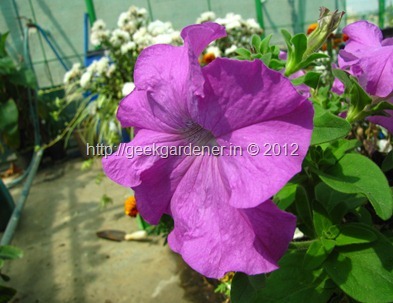 You need me to tell how to enjoy watching petunia flowers? Get outta here! Here are some petunia snaps for your viewing pleasure. 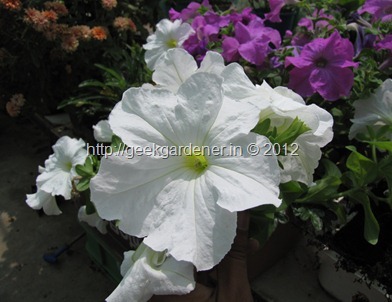 Ok, you have grown petunias ,had them flowering and they did extremely well in that season. Next season, what are going to do.. head to the same shop/nursery pickup the same plant and grow ? Or would you like to be smart, save your own petunia seeds and grow it yourself and brag off later.. who wouldn’t like an ego boost. If you are interested in saving the seeds proceed further. 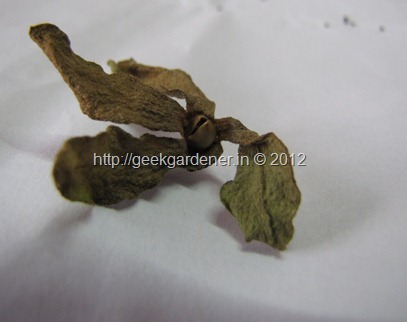 Petunia seeds are small, so first spend some time identifying the flower that is faded and withered. In the center of the flower you will notice a conical fruit bearing all the seeds in it. The idea is to let the pod dry out but before it bursts out, you come in the scene and collect the seeds. Wicked eh! The seed pod inside the spent flower. Seed pod full of seeds for your next season! I am currently trying to grow flowers including petunia in pots. I bought seeds for SPAR. Seeds are of hybrid variety. The problem i am facing is none of the seeds germinated! I seeded in small containers with vermiculite, neem mix ( i expected it to avoid fugus ) and organic mixture and regular soil. The rough ratio may be around 10:10:20:60. I followed all the instructions (which I believe 🙂 ). Packing asked to use fungicide before seeding which i did not. I did covered pot with poly-sheet. But after 10 days nothing is there and also i can see some white fungus on surface of soil! Now it is raining a lot in bangalore, do this have impact on seeds? Lovely post, as usual, and inspiring too. Are the seeds available for us? Kindly let me now if any other seed also available with you? I will be very grateful. When is the correct time to sow petunia seeds? 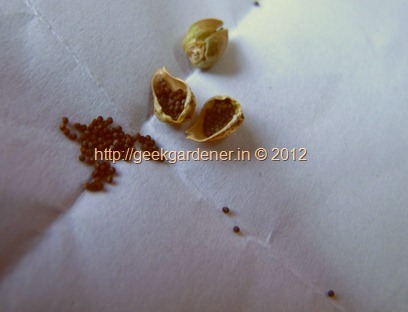 hey can u name/ direct me to any good nursery in gurgaon from where i can buy seeds eg. petunia/ sunflower etc. Always worth saving seed, we often do. Sometimes you can get quite unexpected crosses and interesting new plants with the new plants. 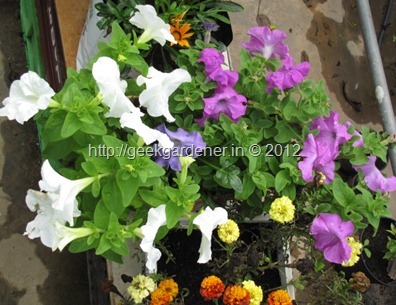 When is the best time to grow petunias in Bangalore? 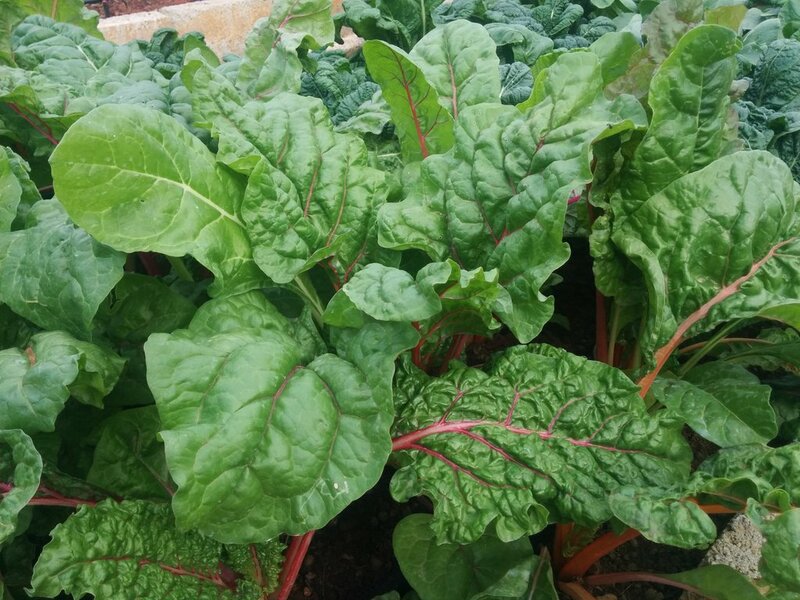 What are some other good, fairly hardy seasonal plants to be grown in Bangalore? And what is the best time to grow them?